The American Roman Catholic Church can be a very conservative institution indeed. And few Irish-American prelates have a reputation for being on the progressive wing of that conservative institution. That’s why John Ireland, Kilkenny born bishop of the Twin Cities of St.Paul/Minnesota stands out. He was a 19th century political progressive on issues like Church/State relations, education and immigration. He was friendly with two American Presidents, Theodore Roosevelt and William McKinley and was vocally opposed to the widespread and pervasive political corruption of the late 19th century USA and to racial inequality. Cardinal Paul Cullen he was not. Ireland, disturbed by reports of the economic conditions being experienced by Irish immigrants in Eastern cities, and conscious of the need to populate the wideopen spaces of the Minnesota hinterland, established colonies with names like Clontarf, Avoca and Iona that provided land and a fresh start for impoverished urban dwellers. The Kilkenny-born archbishop was highly successful in populating the often inhospitable prairies with pockets of Irish settlements through his Catholic Colonization Bureau The project brought more than 4000 families from eastern slums onto 400,000 acres of farmland in rural Minnesota. Many of the colonies remain relatively intact to this day. Ireland’s right-hand man in this enterprise (which used railroad land) was Roscommon man Dillon O’Brien, born into the Catholic landholding class, who had been financially ruined by the Famine and forced to emigrate. However, the philanthropic archbishop had an unhappy experience when he agreed to take on a group of impoverished fisherman from the West of Ireland that he misguidedly attempted to turn into frontier farmers. The saga of the ‘Connemaras’ is part of the lore of the American Midwest. Ireland had to be coaxed into accepting the fishermen and their families in the first place. He allowed himself to be persuaded to take them on but the wisdom of his initial reluctance was rapidly justified. The fifty or so families that came from Connemara were coastal inhabitants. When Dillon O’Brien’s son first saw them he was not impressed. He described the group, mostly monolingual Irish speakers, as ‘not the competent, but the incompetent; not the industrious but the shiftless; a group composed of mendicants who knew nothing about farming’. They were settled near a pre-existing colony called Graceville. The settlers already there were even less well disposed towards the new arrivals than O’Brien’s son. The timing of their arrival was unfortunate as well. It coincided with the harsh prairie winter. Opportunities for planting were not promising. The soil was only to be penetrated with pickaxes rather than ploughs or spades. One of the first things the bewildered fisher folk did was to eat or sell the seed crops allocated to them. Ireland was forced to find employment for many members of the group in Minneapolis and St Paul. Worse still from his point of view was the charitable intervention of the local Freemasons. The Connemaras, happy to accept assistance from any source, had no awareness of the antagonism that existed between the overwhelmingly Protestant Masons and the American Catholic church. Ireland spoke out against the donors and the recipients. As few of the Connemaras had any English their right of reply was somewhat circumscribed. In attacking such obvious underdogs for accepting the charity of members of a highly respected organisation Ireland lost some of his progressive gloss. Today a street that runs from the Cathedral of St.Paul to the Minnesota State Capitol building is named after him. Despite his brush with the Connemaras he is still held in high regard. 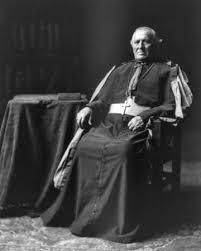 John Ireland, Catholic Archbishop of the Twin Cities, was born 177 years ago, on this day.